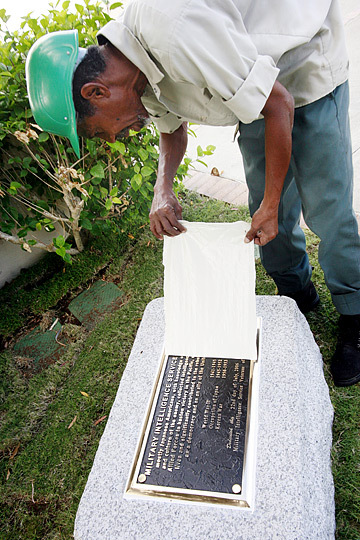 Punchbowl groundskeeper Donovan Morrison pulled a protective covering Friday from a plaque dedicated to the World War II veterans of the Military Intelligence Service at the National Memorial Cemetery of the Pacific. The plaque is to be officially dedicated on Saturday. MORE THAN a five dozen granite stones adorn the National Memorial Cemetery of the Pacific's Memorial Walkway leading to the panoramic vista of Honolulu. Each stone weighs about a ton, with a bronze 12-by-24 inch plaque that speaks "about the character of the American citizen soldier," said Gene Castagnetti, director of the National Memorial Cemetery of the Pacific. These memorials "promote healing and reconciliation," said Castagnetti, a retired Marine colonel. "Mostly Japanese Americans, with knowledge of the language and culture of the enemy, collected intelligence that enabled Allied forces to hasten victory in the Pacific, saved countless lives and significantly contributed to the rebuilding of Japan as a democracy and as an ally of the United States. In August, the 68th memorial stone honoring Vietnam War veterans will be dedicated, Castagnetti said. Seven MIS veterans will participate in the July 22 ceremony, which will begin at 10 a.m.
Castagnetti said the MIS memorial is "in close proximity to the 100th Battalion and the 442nd Regimental Combat Team plaque." Dr. Glenn Masunaga, who served as a translator with the MIS from 1945-46, said he believes "it is fantastic that the MIS is finally being recognized by the government." Masunaga, 81, was a junior at Leilehua High School when the Japanese attacked Pearl Harbor on Dec. 7, 1941. Unlike the 100th Infantry Battalion and the 442nd Regimental Combat Team, Japanese-American soldiers in the MIS served individually or in small detachments assigned to larger units of all the Allied armed forces. Much of their work was classified for decades after World War II. More than 7,000 Japanese Americans served in the MIS as interpreters and translators during World War II, post-war Occupation of Japan and the Korean War. The soldiers, many from Hawaii, translated captured documents and intercepted communications, interrogated prisoners, and persuaded Japanese soldiers to surrender. They served in every battle and every major command in the China-Burma-India and Pacific theaters of operation, from Guadalcanal and the Aleutians to Myitkyina and Okinawa. Masunaga, who was drafted in 1945, said he worked in Monterey, Calif., "translating confiscated Japanese documents." "The Americans wanted to know what the Japanese knew about the Russians, especially troop movements near the Japanese sea side. "I was just a small cog in the wheel." The soldiers of the MIS also were credited with saving the lives of thousands of civilians holed up with enemy soldiers in caves and bunkers, often entering caves unarmed. Four years ago, the unit was awarded a presidential unit citation. Following World War II, MIS soldiers served as linguists in occupied Japan. After the Korean War began, MIS linguists provided intelligence-gathering services, interviewing captured enemy soldiers, many of whom spoke Japanese because of Japan's earlier colonization of Korea.